Momentum in an athletic event can be fickle, changing sides and affecting outcomes of games. 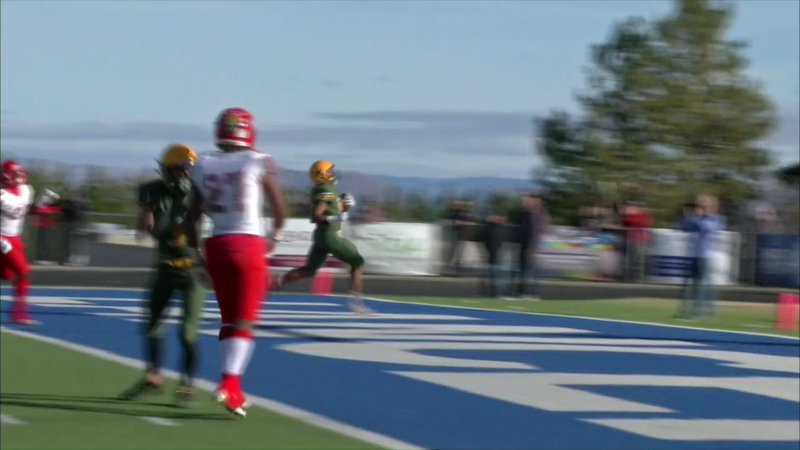 Momentum was at its most temperamental self when Arbor View of Las Vegas played Bishop Manogue of Reno in the 4-A State Semi-final game played at McQueen High School and won by Bishop Manogue 42-34. 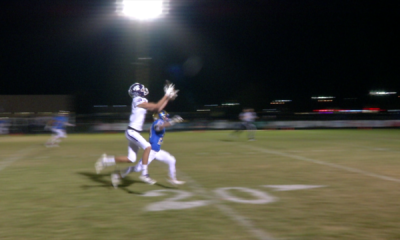 Arbor View dominated the first quarter and was on its way to doing the same in the second quarter when the two biggest momentum stoppers of all reared their game-changing heads, an injury and a turnover. Arbor View had a 20-7 lead over Manogue and was driving for more points when a screen pass to Aggie running back Kyle “Bubba” Graham carried Arbor View to the Miner 35-yard line. On the play Aggie center Tyler Kincheloe injured his ankle, not to return to the game. The next two snaps from center to Aggie quarterback Logan Bollinger were fumbled with the second one being picked up by Manogue. The Miners scored two quick touchdowns to close the half, a 25-yard pass from quarterback Drew Scolari to wide receiver Dontell Jackson and a 19-yard run by running back Peyton Dixon and suddenly Manogue was the team heading in to the locker-room with a 21-20 halftime lead. 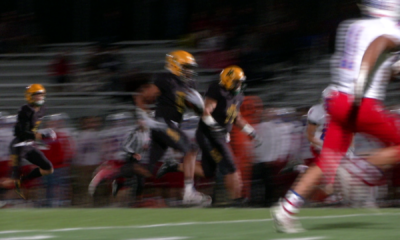 In the third quarter the flow of the game still favored Manogue as running back Peyton Dixon scored the only points of the quarter on a 76-yard touchdown run pushing the score to 28-20 Manogue. Dixon rushed for 296 yards and scored four touchdowns on the day. The fourth quarter brought the game from simmer to a high boil with the two teams combining for four touchdowns. After the second Arbor View touchdown pass from Bollinger to tight end York St. Hilaire, Arbor View still had hope trailing 42-34. Manogue’s attempt to pile up some first downs and run out the clock did not succeed and after a poor punt, momentum quickly chose Arbor View as its late-game partner. Needing a touchdown and a two-point conversion to throw the game in to overtime, the Aggies resorted to their seldom used passing game. 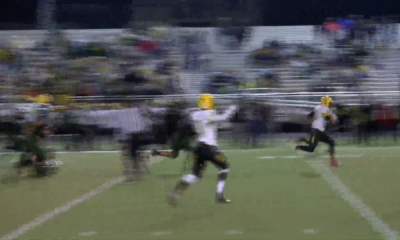 Bishop Manogue’s Dontell Jackson quickly stole any hope of an Aggie comeback by intercepting a Bollinger pass. It was Jackson’s second interception of the day and Arbor Views third turnover of the game. Arbor View coach Dan Barnson succinctly summed up the turning points of the game by pointing out that “the team that loses the turnover battle, usually loses the game.” Arbor View had three turnovers (a fumble and two interceptions) while Manogue put a zero in that column. Arbor View finishes its season with a 12-2 record while northern champion Bishop Manogue runs its winning streak to eight games and its overall record to 11-3. The Miners will play the Bishop Gorman Gaels (a 42-28 semi-final victor over Liberty), winners of the last nine 4-A state football titles, on Saturday December 1 at Sam Boyd Stadium in Las Vegas. Kickoff is scheduled for 12:10 p.m.